We are a civic organization committed to improving the quality of life for people who live, work, and learn in Watertown. Our goal is to mobilize our citizens to address our community's challenges, build on our strengths, and to create a healthier, more just and prosperous community. We are working to form coalitions in support of citizen-initiated projects. If your neighborhood or civic group needs town-wide support for an initiative, let us know. Contact us at info@sustainablewatertown.org to receive updates on our initiatives. 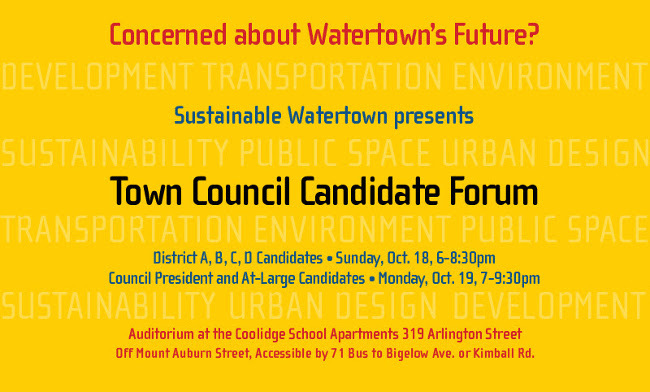 We hope you will decide to participate and help us create a more liveable Watertown for the future.